This Liberal Nationals commitment for European-style high speed rail in Victoria has the potential to transform our state, taking the pressure off Melbourne and opening up fast access to and from our regional centres. It can turn Victoria from a state dominated by a single massive city into a state of many cities. A Liberal Nationals Government will revolutionise Victoria’s passenger rail network by delivering European-style High Speed Rail right across Victoria. Melbourne’s population squeeze is putting enormous stress on our roads, public transport, schools and hospitals and that impacts everyone’s quality of life. Unplanned, unmanaged population growth is killing Melbourne’s liveability. Daniel Andrews says it’s inevitable that Melbourne’s population will hit 8 million people in the next three decades. I don’t accept that. I say we need to decentralise our jobs and population throughout Victoria. Bringing Victoria’s cities closer together with European-style High Speed Rail is the cornerstone of the Liberal Nationals plan to ease the population squeeze by decentralising our jobs and our population. European-style High Speed Rail to regional cities will also give Victorians more options for affordable housing, more lifestyle choices and more employment opportunities. Reaching speeds of up to 200 kilometres per hour, Victoria’s new high speed rail network will be the fastest in Australia. The High Speed Rail project will see the rebuild of much of Victoria’s current Class 1 track to 200 kilometres per hour operation as well as major track improvements on every other passenger rail line. High Speed Rail will almost halve travel times between Melbourne and Geelong and between Melbourne and Traralgon. 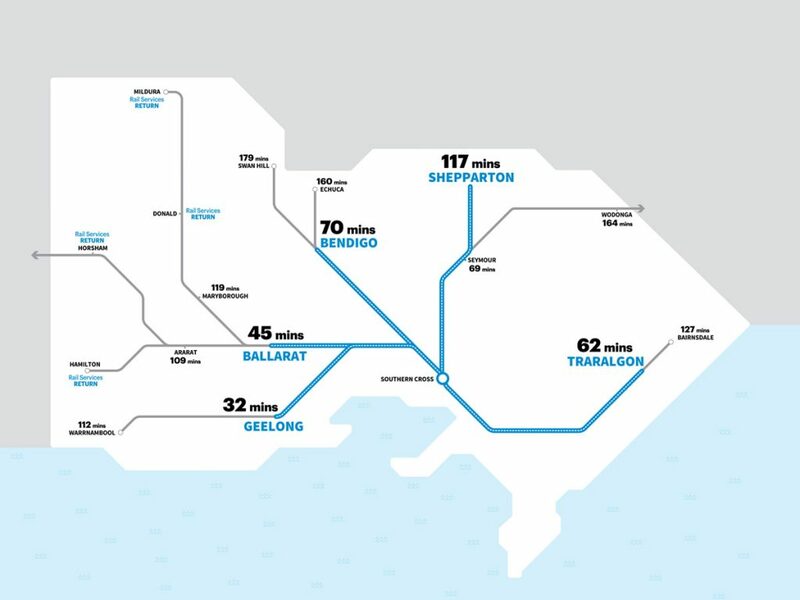 Within the first term of a Liberal Nationals Government, travel times between Geelong and Melbourne will be slashed to just 32 minutes, an improvement of 26 minutes on the current timetable. European-style High Speed Rail will mean passengers on the Melbourne and Traralgon route will save 67 minutes on their current journey with a new commute time of just 65 minutes for the 160 kilometre journey. The Ballarat and Melbourne transit will be cut to less than 45 minutes or nearly 30 minutes less than the present travel time. High Speed Rail will cut Melbourne and Bendigo travel times by 33 minutes to around 70 minutes. Travel times between Melbourne and Shepparton will be cut by 29 minutes. It will also see the substantial upgrade of every other major country rail service, to Wodonga, Bairnsdale, Echuca, Swan Hill and Warrnambool as well as the reopening of currently closed passenger services to Donald, Mildura, Horsham and Hamilton. Not only will travel times be much faster, travel will also be more comfortable. A Liberal Nationals Government will fund two new fleets of new-generation, faster, inter-city flyer and long haul variants of the successful V/Locity trains which will provide better comfort and leg room, safety and amenity for passengers. The first fleet of high speed trains will be delivered in the first term of government with a second fleet of possible double-deck models to follow. Building European-style High Speed Rail will also take more cars off our roads and that will save lives and cut traffic congestion. This $15 billion to $19 billion super-infrastructure project will be planned and built in three stages over the next ten years. The following table includes projected time savings for High Speed Rail for regional cities and towns. The upgrades will also open the way for a greater number of daily rail services. At the core of the Liberal Nationals plan for a European-style High Speed Rail is the further separation of the regional network from the metropolitan network thus increasing capacity and avoiding a ‘dump and run’ at the end of the suburban rail network. The High Speed Rail project will also complement existing plans for an Airport Rail Link and the Metro Tunnel. Melbourne is jam packed with a population of five million and growing by 2,700 people a week. Unless we start to take action now, on current population projections Melbourne will overtake Sydney by 2035. At an estimated total cost of $15 billion to $19 billion this super-infrastructure project will transform regional Victoria and is affordable, sensible and realistic. Add to that, another 19,000 new jobs to build the Liberal Nationals congestion-busting new highway and arterial road projects and that’s a total of around 30,000 new jobs across Victoria. Only the Liberal Nationals will ease the squeeze on population growth and have a plan for the right population growth in the right areas at the right time.